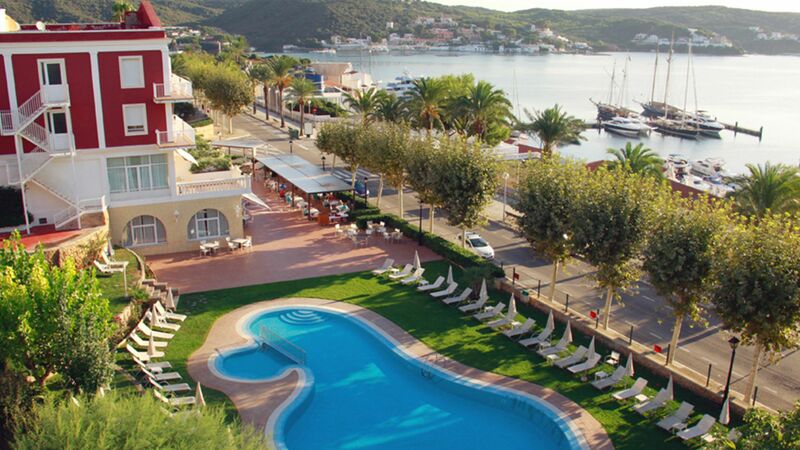 Hotel Port Mahon is ideally located in a quiet area of Menorca’s capital. Enjoy views over the natural harbour, which is one of the largest in the world and lined with great seafood restaurants. It’s just a five minute walk into historic Mahon, which has pretty plazas, markets, Georgian buildings, and nightlife. Other nearby sites include golf courses and La Mola Fortress. The four star hotel has beautifully manicured grounds, with a peaceful ambience. Relax by the large outdoor pool and sunbathing terrace, which has views of the port. You can reach the bustling promenade by taking a lift, or walking the 112 steps and it’s just seven kilometres to Cala Mesquida, a rocky, white sand beach. There are 82 tastefully decorated rooms in Hotel Port Mahon, which boasts a colonial design. You can opt for a sea view or chic suite with living area and terrace. 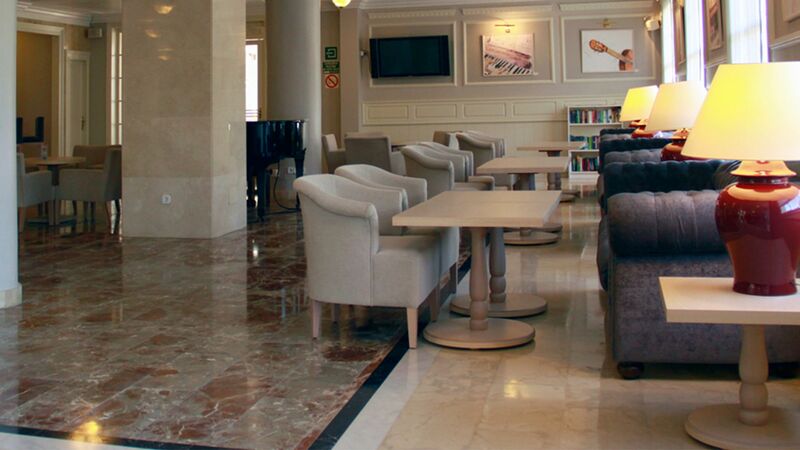 Dine at the buffet and à la carte restaurant and have an evening drink at the pool or piano bar. Although the hotel isn’t strictly adults only, Sovereign doesn’t accept bookings that include children. Please note that there are some steps down to the pool and dining areas of the hotel. Hotel Port Mahon’s restaurant serves a diverse buffet, which is particularly popular for breakfast, and has indoor and outdoor seating with sea views. There’s also an à la carte lunch and dinner menu. Dishes include local fish and seafood specialities. The Mahon cheese is a favourite. Head to the pool bar for a light lunch, snack or to cool off with a refreshing drink when you need a break from the sun. The bar has views overlooking the pool and garden. The Piano Bar is the ideal place for evening drinks, with a wide menu including wines, beers, spirits, and cocktails. The bar opens out onto a terrace and has a piano for live music. Hotel Port Mahon has an outdoor, freshwater pool set on a spacious terrace with plenty of sun loungers. There’s also a shallow section of the pool especially for children. Hotel Port Mahon lies just seven kilometres from Cala Mesquida, a picturesque white beach with soft sands and rocks. Staff at the 24-hour reception can call a taxi to take you to the beach. During the summer months, Hotel Port Mahon has evening entertainment twice a week. Head to the beach for water sports such as kayaking and water skiing. Golfers will love Son Parc’s 18-hole course, which lies 22 kilometres from the hotel. Hotel Port Mahon can be found on Menorca’s east coast, in the island’s capital, Mahon. This pretty town is home to Gothic architecture and 18th Century mansions, with narrow streets filled with palm trees. The port area is ideal for those wanting to book boat trips or admire the luxury yachts, while there are some beautiful golden sandy beaches just 10 minutes away. In the town of Mahon itself you’ll find a wide selection of restaurants and bars, as well as lots of opportunities for shopping. Choose from little boutiques and designer shops where you can pick up great deals on fashion, souvenirs and locally crafted goods. Hotel Port Mahon is a 10 minute drive from Menorca Airport. Single rooms measure 18m² and have a balcony or terrace measuring 2.7m² with garden views. Twin Side Sea View Rooms measure 21-23m² and have 2 beds, bath or shower, WC, air conditioning, satellite TV, hairdryer, minibar, telephone and side sea view. A safe can be hired (payable locally). Twin Rooms measure 21-23m² and have 2 beds, bath or shower, WC, air conditioning, satellite TV, hairdryer, minibar and telephone. The room has a balcony measuring 3.3m². A safe can be hired (payable locally). Twin Harbour View Rooms measure 21-23m² and have 2 beds, bath or shower, WC, air conditioning, satellite TV, hairdryer, minibar and telephone. The room has a balcony with harbour views measuring 3.3m². A safe can be hired (payable locally). Suites measure 42m² and have sea views from the 12m² balcony, bath or shower, WC, air conditioning, satellite TV, hairdryer, minibar, telephone and are a larger room than the twin category. A safe can be hired (payable locally). Guests celebrating their honeymoon, birthday or anniversary will receive a bottle of Cava for holidays between 01 May - 31 October 2019. This is a very friendly comfortable hotel. The rooms are spacious and it is in a quiet location with easy parking outside. It is a lovely stroll to the old town either along the cliff top or along the harbourside. The breakfast was delicious with a fantastic selection of hot and cold buffet. The views over the harbour were splendid. We would definitely stay there again. Well...I stay in this hotel quite often due to job related trips. The hotel and rooms are quite old style, building is quite old as well. Due to wintertime restrictions, of course I didn?? ?t tried the swimming pool. Internet is ok both in the rooms and in the lounge / restaurant, as well as in the outside patio. Breakfast is decent, but nothing really special. The service and all the staff is really friendly and if they are not too busy, it is a pleasure to stop a few minutes and speak with them, you will always learn something new! We had the best Xmas and New Year ever at this hotel with Ramblers Worldwide holidays. The food was good, accommodation very comfortable. The staff were all very friendly, welcoming, cheerful, full of smiles, and went out of their way to make our stay as pleasant as possible. The Reception staff were exceptional. One helped us retrieve a lost camera left in a taxi before we left to return home. Cannot thank him enough! Lovely hotel with a fantastic harbour view, although in need of updating as looking tired. Exceptionally clean inside and out, very friendly and helpful staff. Extensive breakfast with fresh fruit, cold meats and cheeses,range of hot food varying slightly each day, breads, cakes, yoghurts teas, coffee, water and even champagne. Plenty of helpful,friendly waiting staff. Outside pool and sitting area spotless and overlooking the harbour. Regular live music in the evening however maybe because of the time of year it was quieter and maybe more suited to the retired population. Evening meals ok for hotel mass produced food buffet style and plenty to choose from but certainly not on a par with restaurants available in the area. We had a lovely holiday here and would stay again, a nice touch also was when we came back from a day out the manager had left a bottle of champagne for my partners birthday which we hadn't mentioned. We enjoyed a week here in October and will return there the next time that we visit Menorca. Situated away from the city centre it is in a quiet area, but within a five minute walk from the centre. There is a supermarket just a short distance away, so buying in any supplies that you may require is easy. We opted for a room with a view of the harbour and this did not disappoint us. The view down through the harbour towards the sea was beautiful. From our window we were able to watch the sun rise each morning. The balcony was big enough to sit out on when we weren't out and about the island. Our room was kept spotlessly clean. Our only criticism of the room would be that it was a bit cramped and a bit short on drawer space. Breakfast was similar to what is on offer at most hotels that we have stayed at in the past. Cereal. Cold meats Cooked eggs, bacon, etc. Tea/Coffee. Fresh fruit, Cakes. If there was anything to moan about it was the same as anywhere else in that they were catering for a large number of guests so nothing was cooked individually for each person. There were plenty of staff members helping in the dining room, clearing away used dishes and cutlery quickly and efficiently. All of the staff, throughout the hotel were friendly and helpful. We wanted to hire a car and the reception staff were able to arrange this for us. The hotel does not have its own car park, but plenty of free on-street parking is available just outside, or if necessary there is a car park within a hundred yards or so. We are not able to comment on the evening meal available in the hotel as we opted to use the local restaurants, of which there are many along the quayside. We used the lift just along the road to get down to the quay level.